Apologies for the brief hiatus! The Bloody Best gals were busy traveling and drinking bloody marys in other cities. Now that we’re back in sweet home Chicago, let’s pick up where we left off and enjoy some Windy City brunch, shall we? 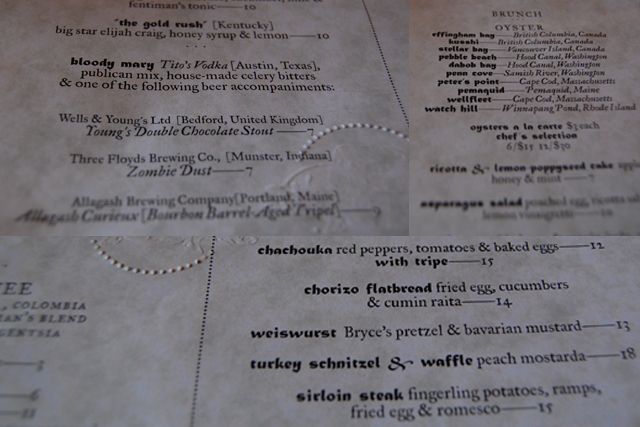 For our most recent adventure, we decided to give The Publican a whirl. And why not? Chef Paul Kahan of Avec, Blackbird and Big Star and his crew have produced culinary gold for the past few years (note: One half of this duo practically lives at Big Star). 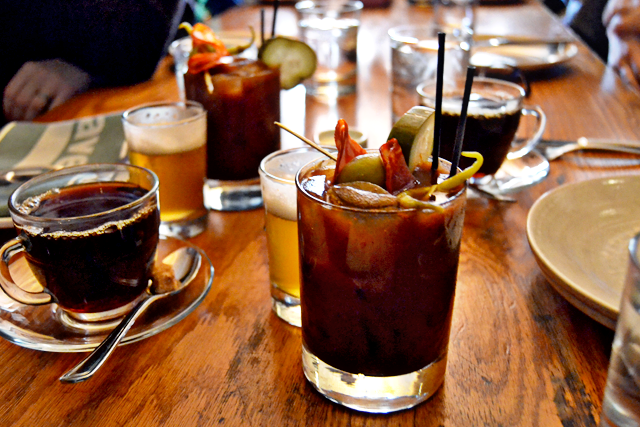 And our Instagram feeds had us dreaming of Publican’s bloody mary. The only real decision was whether to go on Saturday or Sunday. 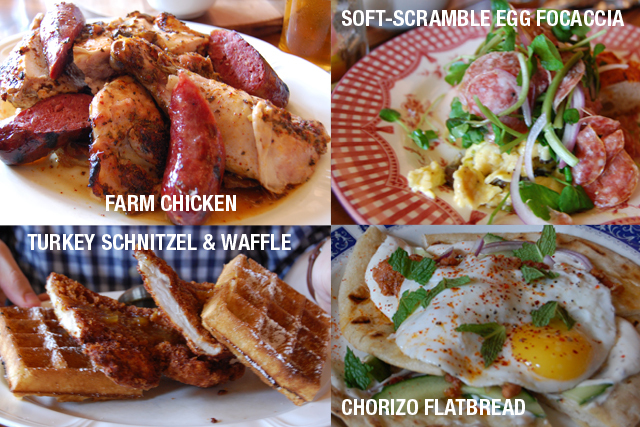 As it turns out, brunch menus differ by day of the weekend. Saturday’s brunch menu includes oysters. And though Sunday’s brunch menu, which includes red wine poached eggs and pork belly bibimbop, sounds delicious in its own right, oysters won. There’s a lot going on at Publican in a very good way. First of all, the design. The restaurant layout takes a European beer hall approach with communal dining and a flood of natural lighting. It gets loud around the table, but in the end, it adds to the mirthy ambiance. Let’s talk about why we’re here though. The Bloody Mary. Because Publican is a self-proclaimed “beer-focused restaurant,” it’s no surprise you won’t get a PBR or Old Style beer back. In fact, you choose your own. On Saturdays, you pick between Young’s Chocolate Stout, Three Floyds’ Zombie Dust or Allagash Curieux. Zombie Dust was the popular choice with our crew. What makes this bloody mary so bloody good is its homemade celery bitters and pickled vegetable garnishes. Normally, half of this duo doesn’t like celery and thinks its a cop-out garnish. But celery bitters make the Publican Bloody Mary a true stand out. The pickled vegetable garnishes were some of the best we’ve experienced. Pickled cucumbers, cauliflower and onions. Awesome. The pickled cucumbers add a hint of vinegary sweetness, and if anyone knows if you can buy them somewhere, please do tell. 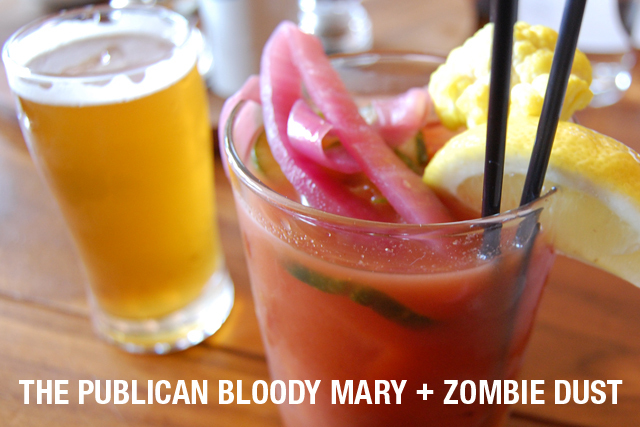 The Publican Bloody Mary is also made with a homemade mix and Tito’s Vodka. The mix itself has a nice subtle kick and a smokey undertone. Paired with the celery bitters and pickled flavors, this bloody mary is also solid gold. Also of note is its value. Price varies by beer back choice, but $7 for the Publican Bloody Mary and a Zombie Dust beer back seems incredibly reasonable, especially with the quality of ingredients. 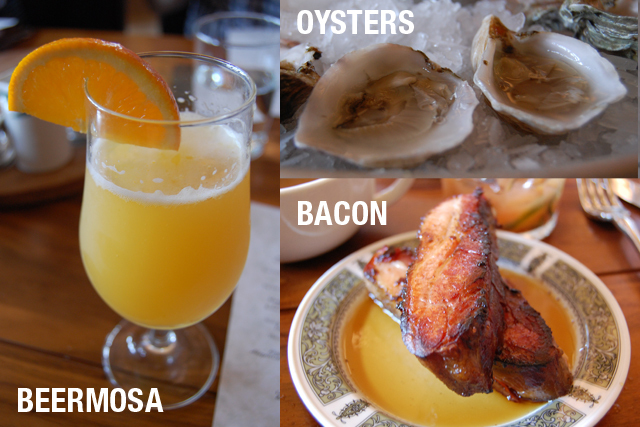 Oysters aren’t typical brunch fare (right? ), but they were a fun early afternoon treat for us. They are handpicked by purveyors from around the continental US and Canada and served with a homemade hot sauce. And the bacon!! Dear god, the bacon. Maybe the best bacon of our lives, which is a grand statement. 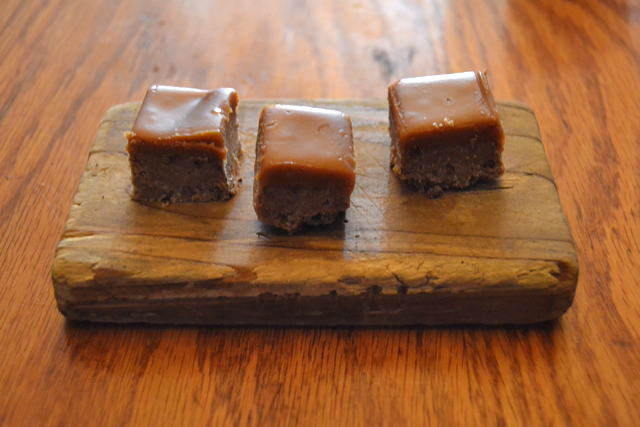 It’s thickly cut, perfectly seasoned and charred, and then bathed in a light maple syrup. Are you drooling yet? 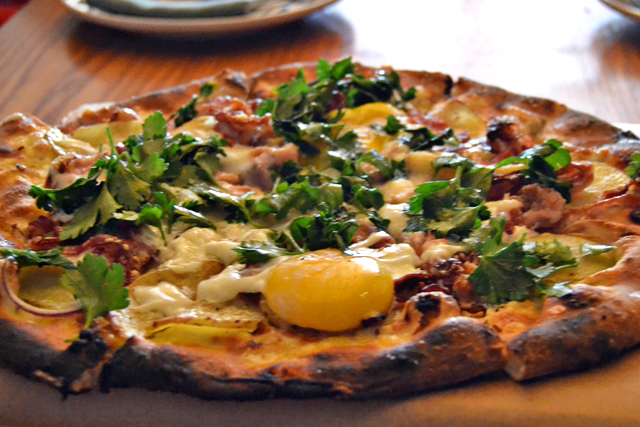 Publican prides itself in taking a farmhouse fare approach to its menu. And they’ve seemed to master simple, delicious food. As many restaurants do these days, Publican sources organic local meat. The pork, for example, comes from a farm in Iowa. The food did not disappoint. The Farm Chicken was perfectly seasoned and came in a hearty portion along with homemade sausage and hashbrowns. The Soft-Scrambled Egg Focaccia was tasty and uncomplicated with onions, mushrooms, leeks and salami. And the Turkey Schnitzel & Waffle was delightfully sweet and savory. Perhaps it had something to do with the fact that Paul Kahan was in the house. 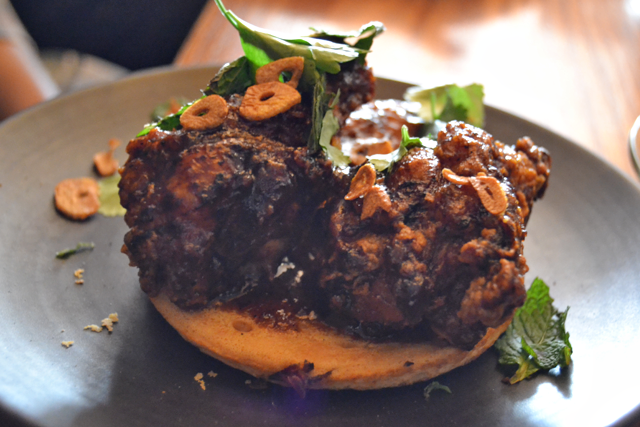 Or more likely that The Publican has nailed amazingly simple, delicious food and drinks. Either way, everyone in our brunch crew left the table very happy. Wishing you bloody mary delights and sweet culinary dreams. Until next time!